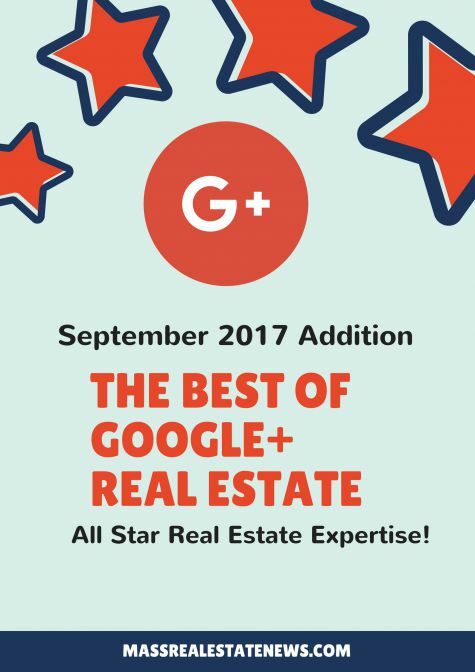 Once again this month, there are some incredibly talented real estate professionals who have been sharing their articles via Google Plus to better educate real estate consumers. The more buyers and sellers know about our industry , the better able they are to make an informed decision when the time comes to buy or sell a home. It really is that simple. Often times the content shared is aimed to assist other industry professionals too. You will find information in this article that can help you gain more brand exposure, reach more consumers, and generate more clients. Things I know we all want! This compilation contains 11 articles and a bonus opportunity sprinkled in for good measure. f you did not make the list, there will be another opportunity next month so keep blogging! 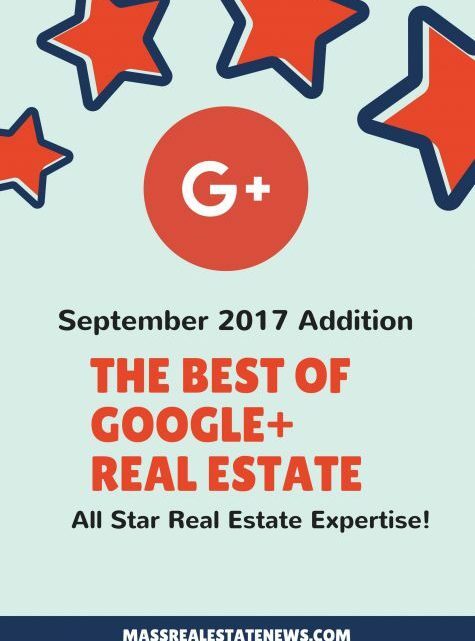 Let’s go ahead and take a look at some of the very best real estate articles on G+ in September 2017. A timely article considering the southeast has taken a beating this past month from both Hurricane’s Harvey and Irma. At some point during/after the recovery begins, there will be a need for real estate services in the affected areas. What options are available to buyers who may be looking at damaged properties? What can sellers expect and how will the devastation affect the value of their home? This article provides valuable insight for anyone dealing with the aftermath effects of a hurricane. This excellent article by Fred Franks Jr. provides key advice to help consumers who are considering buying or selling a home after a hurricane. Not only will some level of rebuild most likely be needed, but it is imperative to engage with qualified professionals to resolve the myriad of issues you may be facing as a homeowners. It is equally important for buyers to make sure they hire licensed pros to thoroughly inspect the property as there very well could be issues that need to be resolved before the property is purchased or after you have bought the home. Whatever situation you find yourself in, this article explores your options. Another quality offering by Luke Skar that explores 7 key ways to improve your credit score. The better your credit score, the more options buyers will have, including improved mortgage rates, so it makes sense to do everything in your power to improve your credit score! Luke lists 7 things consumers should know about and work on improving including paying bills on-time (always), credit card tips, the effects of filling out too many credit applications, and even sound advice on why using the services of a credit repair agency could be beneficial. As Luke mentions in this article, an important thing consumers need to understand is that fixing credit issues and improving your credit score “…is a marathon, not a sprint“. Statistically, millennial home buyers make up the largest percentage of real estate buyers in the U.S., cornering 34% of the market. Not only are those 36 and younger actively looking for homes to call their own, but they are well educated, savvy, and have a good idea what they like/dislike long before they step foot inside a property. This article explores 10 ways that millennial’s are changing real estate markets around the country and how agents can be better prepared to assist them when it comes time to look for and purchase a property. Whether it is advanced technology in homes, location misconceptions, assist from family members, or even their research habits, this article explores the importance of understanding exactly what millennial buyers are looking for, what their specific needs may be, and how real estate professionals can assist. The more homeowners and agents understand about these savvy buyers, the easier it will be to adapt and keep up. Sellers want to net as much money as they can when they sell their home; that is understandable. Some decide that trying to sell For Sale By Owner (FSBO) is a smart move because they can save money by not having to pay a real estate commission. While that is true, statistics from the National Association of Realtors identifies that FSBO sellers net $60K less than traditional sellers. This article by Bill Gassett identifies 8 reasons selling your home without an agent could lose you money. In their haste to do it alone, sellers often get the price wrong, do not know where to market the home online to get the best exposure, and often do not understand the paperwork and costs associated with selling a home. Quite often a Zillow estimate is used which contributes to the seller getting their listing price so far off. Don’t make the Zestimate mistake so many others have made! While selling FSBO sounds like a great idea, it is often wiser to employ the services of a local real estate agent, who will do everything in their power to get your home seen by as many buyers as possible. That is a question that only the homeowner can answer but it is important to note that homes sell year round so waiting for the “perfect time” means you are wasting current opportunities to get your property seen and sold. This article by Karen Highland explores what motivates home sellers, how to determine your home’s value, and provides sage advice for seasonal home sales. The right time to sell your home is now (or later) based on your readiness to move on and deal with the stressors that come with putting your home on the market. Do you want to sell quickly? Looking for top dollar? Need to net a certain amount? Is the home well maintained? Is it ready for buyer scrutiny? How flexible/tolerant will you be with price, fixes, and/or updates? Knowing the answers to these questions, and others this article explores, will help you decide if it is time to put your house up for sale. This comprehensive article by Jeffrey Hensel covers all the basics of bridge loans. This type of financing is often misunderstood and this article explains what bridge loans are, what they can be used for, their pros/cons, and a host of other pertinent information to better educate anyone who is not sure whether they are a good fit for their particular need. It is also useful for anyone looking to gain insight for potential future use as well as a brush-up for real estate professionals who may not be too familiar with this type of loan. Also included is key information about how to find a bridge loan lender (typically private money lenders instead of banks/credit unions), the amount of money you can borrow with this type of loan, borrower requirements, and even prepayment penalties if applicable. When used properly, bridge loans can be a smart financing option for real estate consumers. Ask real estate professionals who extensively use social media to reach a larger audience where they see the most traffic to their websites coming from, and many will quickly say without hesitation, Pinterest brings the most consumers to their site. For those who are actively using Pinterest as part of their real estate marketing, they understand that quality content surrounded by decent graphics is a winning combination. In this article, Kyle Hiscock expertly explains 3 reasons why real estate agents should use Pinterest. He covers the importance of writing epic articles, how critical it is to include outstanding graphics, and how you can exponentially increase your followers and shares by joining Pinterest Groups. Add this site to your real estate tool belt and reap the rewards! When most sellers think about having an open house they picture a bunch of qualified buyers coming through their house. If only this were the reality of real estate open houses. This picture unfortunately is far from the truth. Many of the people who visit open houses don’t belong. Lots of people don’t realize there can be some significant downsides for holding an open house. Do yourself a favor and educated yourself on the pros and cons of an open house. Many real estate agents will never mention the fact that open houses carry the risk of crime or that many of the visitors will not be qualified to purchase. Bill Gassett does a great job summarizing both sides of the coin with open houses. Thankfully, Joe Boylan has put together a quality piece that should help real estate consumers understand real estate contingencies. This article will help dispel any misconceptions buyers and sellers may have about this topic. It also provides them with a road map to understand the types of real estate contingencies as well as specific details about each of the 5 contingencies consumers will most often deal with. Things like title searches, homeowner associations, inspections, finances, and even the final walk-thru can cause delays or cause an issue that requires some action to resolve. In some cases, backing out the transaction is warranted, especially if the contingency in question is part of the contract to begin with (it is, right?!). Closing on a home is the easy part…getting there is the adventure! When you are selling a home for the first time it is easy to make mistakes. In fact, if you have not sold in quite a while it is also easy to make fairly simple blunders. Who wants all that heartache when selling a home. Nobody right? Well do yourself a favor and check out the excellent advice from Maria Mastrolonardo, who has put together some solid advice for home sellers in her article explaining home seller mistakes to avoid. If you’re going to be selling in the near future the article has some top shelf tips. Depending on how much debt you have accumulated, it can take quite awhile to dig yourself back out and be in position to actually purchase a home. The good news is that with a firm plan and a little patience, you can definitely make it happen. For those in this situation, in this excellent article, Dan Barcelon discusses how to get out of debt so you can buy your first home. Dan says in order to get out of debt, “…you should understand the impact that it has on your life and finances“. First you need to understand what debt it, then you need to reduce your spending (this can be difficult for many), definitely pay more than the minimum balance to drive down the principal as quickly as you can, and avoid taking on any new debt. If you are still struggling, talk with a professional who can you get your debt under control and your finances on the path to recovery. With the vast majority of consumers starting their home search online, it is vital to make sure your home looks its best to catch and keep the attention of both buyers and investors. Obviously, you need to ensure the photos used are high quality and show the property in its best light. This can only happen if you have taken the time to spruce up and perform general maintenance so the home looks its best. The Web appeal of your home can make or break whether a buyer wants to visit the property to begin with as Kevin Vitali points out. Start by ensuring photo of the front of your property (the money shot) is easily distinguishable so you catch consumers attention. Once they like what they see outside the home you can wow them with the photos showing all the interior has to offer. If you cannot get them into the property for a preview you stand very little chance of actually selling them the house. Sellers who want to sell their home during the fall need to be mindful that buyers and investors who are looking during this time of the year may have different needs than consumers who bought during the spring or summer. That does not make it harder to sell in autumn, but there are some considerations that should be addressed to make sure your property is appealing to those out looking. Paul Sian explains that getting your house ready for a quick fall sale includes making sure both the exterior and interior look their best. If you have decluttered the property, painted as necessary, performed maintenance of the home’s systems, and captured the house in its best light with professional photos, video, and/or drone use, it should be easy to right price the property to attract a buyer and close during the fall. Bonus Article: Get more social media shares for your blog! For those who are interested in gaining more viewership, increasing their brand exposure, and getting a lot more shares on their articles, the content sharing site CoPromote has recently re-branded and is now called CreatorCollabs. Thanks to Bill Gassett for pointing this out. Follow Bill’s invitation link and sign up for either a free or paid account over on CreatorCollabs to get your articles seen and shared by more people. In summary, I hope you find these articles both helpful and informative. There is content that buyers, sellers, and real estate professionals alike can benefit from reading. If you find this information useful, please share this Google Plus compilation so others can benefit from the information provided. This monthly best of Google Plus compilation was written by Anita Clark. She is consistently a top producing residential real estate agent in Houston County, Georgia, and has been helping real estate consumers buy and sell homes in middle GA for the past decade. Anita enjoys educating buyers and sellers by providing quality real estate topics and information on her Kathleen real estate blog and via social media to assist local and national consumers and other real estate professionals. Previous Article What are Millennials Looking For In An Apartment?